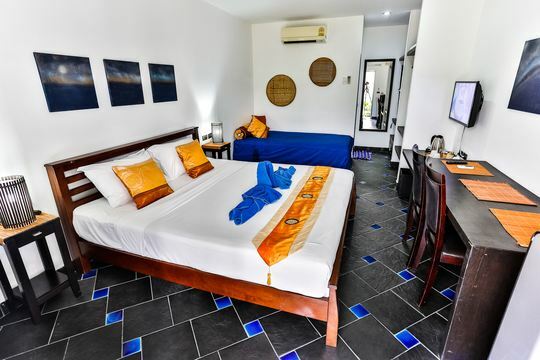 All types of rooms are designed and furnished to fully respond to a comfortable beach life, are furnished with a simple and functional style, but combines modern elements with references to the Thai tradition to always remember where you are and to pamper yourself in a warm home atmosphere. 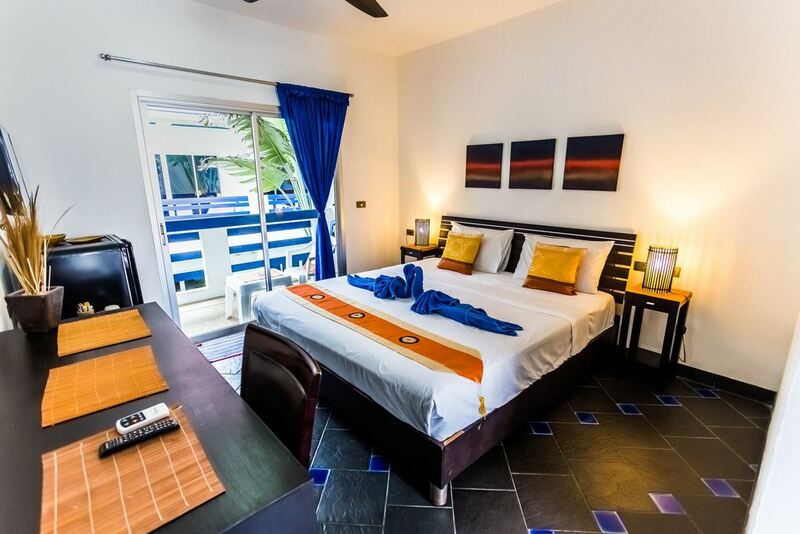 The rooms are spread over two buildings separated by a tropical plant garden, which has a view and direct access to the beach and the sea and which you can enjoy while relaxing in your private terraces or porches. These rooms are all located on the first floor and have a private balcony equipped with chairs and a table for your relaxation and overlooking the garden that leads directly to the beach. They are equipped with a king-size bed (180 cm wide) and are characterized by a door which, when necessary, connects two rooms. These rooms are located on the ground floor and have a private porch, equipped with chairs and a table for your relaxation, and overlooking the garden, which leads directly to the beach. They are equipped with a king bed (180 cm wide) and a single bed, which if not used is set up as a sofa. 32 square meters of room and 7 square meters of terrace with roof. 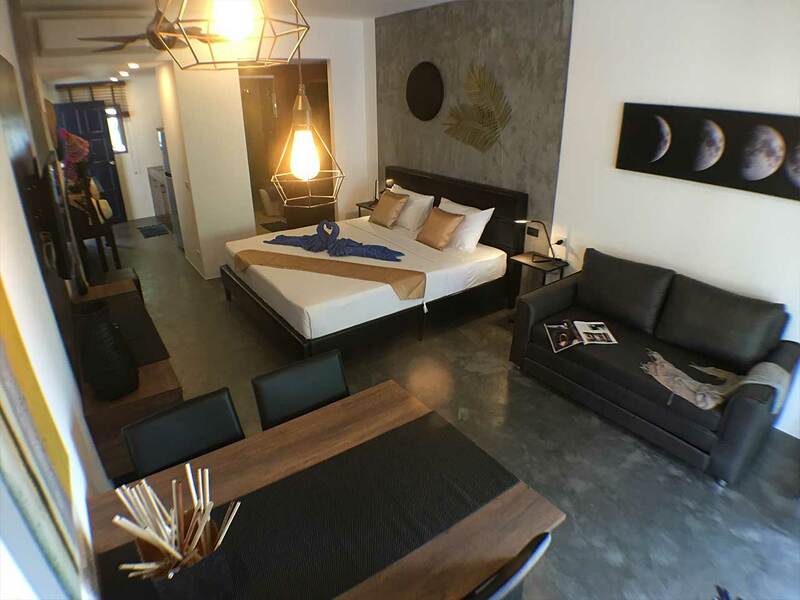 STUDIO23 is located on the first floor and this is equipped with small kitchen fully equipped, dining table with chairs, king bed (180 cm wide) and sofa bed (140 cm wide). This studio has private terrace with roof, equipped with sofa and armchairs for your relaxation, and overlooking the garden, which leads directly to the beach. 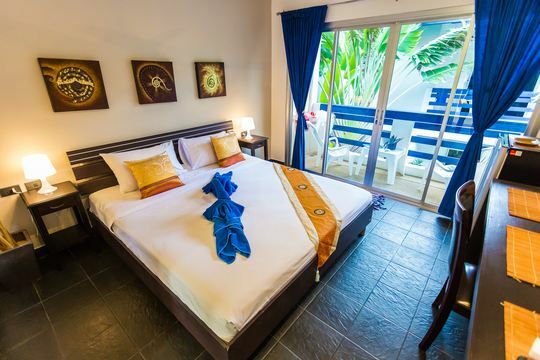 Maphrao is a beach resort located in Kamala Beach, a quiet and warm village, just 10 minutes away from Patong Beach, the most popular site in Phuket, Thailand. Copyright @ 2018 Maphrao Beach Resort Phuket - All Rights Reserved - Web Design by Crazy Web Studio Co.,Ltd.